Golden Blonde is Adam Guzowski, Hugh Deacon, Joshua Becker, and Austin Buckett. 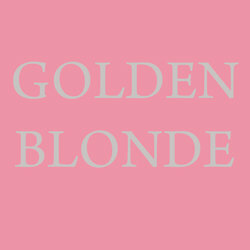 Golden Blonde formed in Canberra where a flourishing house party, warehouse music community was developing in 2009. They have since relocated to Sydney and have shared the stage with the likes of My Disco, Carsick Cars, Mere Women and Thomas William. Influenced by the likes of Warp label electronica and the raw cuttings of hip hop, the four-piece create an acoustic and electronic mix of rigid, skittering beats, choral melodies, brutal sub frequencies, loops and field recordings. Golden Blonde’s upcoming debut album - recorded and mixed by Tim Carr (Mere Women, Talons, Kyu) and mastered by Jeff Lipton & Maria Rice at Peerless Mastering (Battles, Arcade Fire, Lightning Bolt), is to be released in early 2013. Joan is an atmospheric riff that morphs slowly through time. Melt and dissolve.